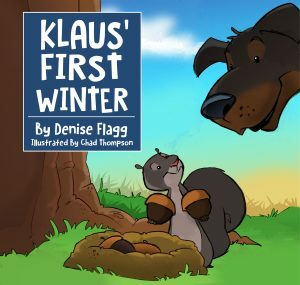 Meet & greet with childrens author Denise Flagg who will read and sign copies of her newest picture book Klaus’ First Winter. The Klaus Series was created in memory of the authors 120-pound, gentle-spirited Rottweiler name Klaus who was always sure to have a snow-covered nose on a snowy winters day. About the book: Teach your kids how animals stay warm in the winter in a fun and interesting way! Take a stroll with Klaus the dog through a charming New England neighborhood and meet some of his friends along the way. On this adventure, you will discover, alongside Klaus, how Sally Squirrel, Billy the Eastern Bluebird, and Freddie Frog survive the cold and snowy winter months. Have fun while learning about migration and hibernation on this fascinating autumn morning walk. About the author: Denises love of books and for animals have merged together to create a childrens book series that entertains as it educates. She serves on a volunteer committee for Friends of the Providence Animal Care & Control Center, a 501(c)(3) nonprofit organization, dedicated to supporting the animals in the city of Providence. Denise is a member of the Association of Rhode Island Authors. She lives in Southern New England with her husband Ernie and their sweet, rescue dog, Jax. A percentage of her book sales are donated to local animal shelters. She is a passionate advocate for making a difference by adopting at your local animal shelter. For more information visit her website at www.deniseflagg.com. Error: Error validating access token: Session has expired on Monday, 08-Apr-19 19:39:38 PDT. The current time is Wednesday, 24-Apr-19 08:51:31 PDT.